The Brooch of Lorn (Braiste Lathuma in Gaelic) is a medieval turreted disc brooch that was taken from Robert the Bruce at the Battle of Dalrigh in 1306. 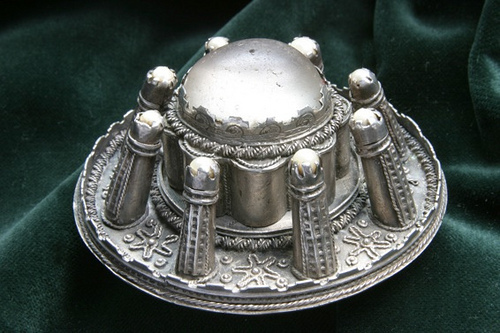 The brooch is one of three West Highland 16th century silver turreted brooches centered on charmstones, with the brooches thought to be resettings of stones that already had certain reputations. The other brooches are the Lochbuy or Lochbuie Brooch in the British Museum and the Ugadale or Lossit Brooch, still in private hands. All three were exhibited together in the British Museum’s exhibition “Shakespeare: Staging the World” in 2012. In the months following, replicas were made to be exhibited in six local libraries in Argyll. The silver disc at the back of the brooch is approximately 4.5 inches across, and the brooch is secured by a hinged pin and catch behind it. Underneath the central stone is an empty compartment, possibly designed to hold a relic. 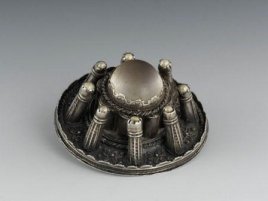 The stone is set well above the base disc, and is surrounded by eight detached turrets (chatons), about 1.25 inches high, and each is topped by a Scottish freshwater pearl. There is a great deal of filigree work in terms of ornaments (stellate applique) and cabled borders. As stated by Catherine Gillies, “There is no reason to disbelieve the tradition that dates the charmstone to the late 13th century; charmstones surface around this time and are linked to the Crusades either in fact or in people’s imaginations for the added holy associations. The re-setting has been narrowed by style and historiography to roughly the third quarter of the 16th century.” An in-depth article about the Brooch of Lorn written by her can be found at the Dunollie website. In 1306 at the Battle of Dalrigh, Robert the Bruce was ambushed by John of Argyll, chief of Clan MacDougall. The attack was revenge for the murder of John Comyn, Lord of Badenoch; a nephew of John of Argyll and rival for the throne of Scotland. According to tradition, the attackers tried to dismount Robert the Bruce, but only pulled off his cloak and brooch. The brooch was kept at Dunollie Castle until being moved to Gylen Castle on the island of Kerrera during the Covenanter Wars. The castle was captured and burned by David Leslie, Lord Newark, in 1647 and the brooch was taken. It was hidden until the early 19th century when it was found in a chest by Major Campbell of Bragleen after his return from fighting in the Napoleonic Wars. A document confirmed that it had been taken from Gylen Castle by the Campbells, and it was viewed by the MacDougall chief before Major Campbell’s death in 1819. It was returned to Clan MacDougall in 1824 by General Duncan Campbell of Lochnell.